Walton Lyon served in the 2nd Armored Division under General Patton in North Africa, Sicily, Normandy and beyond. A remarkable personal account of a hometown young man's wartime experience. After being inducted into the Army on March 18, 1942, Lyon went to San Antonio and then on to Ft. Benning, GA, to join General Patton. He met Calvert’s Red Sessum there and the two Texans had a good time. Patton sent Lyon, Sessum and the rest of the Division all over Louisiana, Tennessee and the Carolinas to train on different terrains. One day, Lyon was working in a tank when Patton and Lt. General Crittenberger, who was about to take command of the 2nd Armored, came by and asked Lyon how they might carry more ordinance in tanks like the one he was working on. Lyon, who did not know who he was talking to at first, casually mentioned that they might tear out some of the flooring to stash more firepower. He was shocked when he realized the two men on horseback were Crittenberger and Patton. But Patton said, “Carry on, soldier,” and later, Lyon’s solution was the one the Army adopted. When Patton was satisfied that his division was prepared, the 2nd Armored left from Ft. Dix, New Jersey, and landed in North Africa on Christmas Eve. Lyon has one vivid memory of Casablanca. One night, the Luftwaffe was shelling American positions in Casablanca, and his commander, George Patton, climbed up on a roof and shot at the German planes with his famous pearl-handled pistols. Actually, said Patton, they were ivory handled, indicating that pearl handled pistols would not be manly. As for Lyon’s memory—check it out. It is in the movie. The 2nd Armored, 67th Regiment, didn’t see that much action in North Africa. They did have a harrowing train ride into the Atlas Mountains. The train engineer kept drinking “Vino,” handed to him by little kids who passed out the wine every time the train stopped. The kids would bang on the cars to get attention. It must have sounded like an attack from the inside. They did not see much action because soon after the 2nd Armored Division arrival, German General Irvin Rommel left North Africa and the big show was over. Lyon spent most of his time in French Morocco in the Cork Forest, a cork plantation owned by a U. S. corporation, instead of engaging the Afrika Korps. But by the time he left North Africa, Lyon had earned his stripes and become a staff sergeant. His squad was assigned to a tank retrieval unit, manning retrieval vehicles. The T-1 and T-2 tank retrieval vehicles were smaller, less heavily armed converted M-3 tanks that came along behind and kept the front line tanks running while trading fire with the enemy. Lyon was trained to be a tank mechanic who could change out a tank engine, whip on a new set of tracks—whatever it took to keep a tank moving forward. In May 1943, Lyon and his retrieval unit were loaded onto an LST (a tank/troop transport) and taken out to sea to sit. They floated in the bay of Tunis for two months. Then on July 8, they saw a convoy sailing by, destination unknown, and joined it. Lyon looked off to his right and his chest swelled with pride to see the Battleship Texas sailing beside him. He never forgot it. The unknown destination was Sicily. The 2nd Armored was part of a joint American/British operation to take Italy from Italian dictator Benito Mussolini, allied to Hitler. When they landed on the beach at Gela on July 10, they encountered stiff resistance from the Italians and then the Germans as the 2nd Armored pushed toward Palermo. Lyon remembers being hammered by German 88’s, big guns used to protect the beach and probably the best artillery weapon the Germans had. After Sicily was won in Patton’s lighting advance around the island, Lyon and his regiment camped in an olive grove until they were told they were going home in November. Sure enough, they sailed to within 600 miles of New York City when their ship turned around and headed for England. After a landing in Scotland, the 2nd Armored went into training in Tidworth, England, for the Normandy Invasion. On D-Day plus 3, Lyon and his retrieval tank were loaded on to an LST only to be moved to an LTC, a British landing craft. Shortly after, the first LST hit a mine and sank. “I lost a lot of friends,” said Lyon, who had escaped death by an inch. Under Williams’ command, Lyon went through six battles, including the Bulge. The Division raced through France in July and August, drove through Belgium and Holland, and crossed the German border at Schimmert, on September 18, 1944, to take up defensive positions near Geilenkirchen. On October 3, the Division went on the offensive again, attacking the Siegfried Line around Marienbert. They broke through, crossing the Wurm River. That is when that “fine old fellow” called them back. He needed the Division he had dubbed “Hell on Wheels” to turn the tide at the Bulge in the Ardennes forest. In the freezing cold and blinding snow, Lyon went back to Belgium and one of the greatest horrors of WWII. Lyon was advancing one day when a GI flagged him down and asked him to rescue a soldier whose foot had been blown off. “We can’t go in,” the soldier said. “It’s mined.” Lyon agreed and maneuvered his vehicle into the woods. As he was edging into a spot right beside the injured man, a mine went off under the retriever’s tracks. It did not damage the GI or the T-1. “On the way out, I saw another guy in a tree and I tried to pick him up but he wouldn’t leave.” He got the injured soldier to a medic and returned for the tree’d soldier. “I finally talked him out of the tree and got him into the turret; he was terrified.” Lyon was recommended for a medal he never got. But the memory seems a little likes a medal–it’s firmly etched in Lyon’s mind. Lyon also remembers a lot of nice people–a little Dutch girl named Jeanie Licke who gave him some little wooden shoes and wanted him to write her after the war. The Sweenies in Belgium had a new car they had hidden from the Germans in a haystack, but they could not drive it until Lyon shared some gasoline with them. Often, Lyon has wished he could go back to those countries and look up the friends he made. On the autobahn, the 2nd Armored was headed for Berlin when Lyon fell behind, burned up a motor trying to catch up, installed another one, then still didn’t get to go into Berlin because he slipped off a gun mount and fell into some protruding metal. His wound would require surgery. He had more than enough points to go home so he decided to take his injury to the US for care. He did not seem to mind missing the grand entry into Berlin too much. Lyon caught a B17 flying from Marseilles to Dakar, then caught a C47 to South America. From South America, he made it back to the US, his home near Kosse, and finally to surgery. He received his discharge in July 1945. Lyon earned a lot of medals from March 1942 to July 1945, but the Army could not find his records, so, recently, his family decided to do the research for the military and make sure their dad received the medals he had earned. 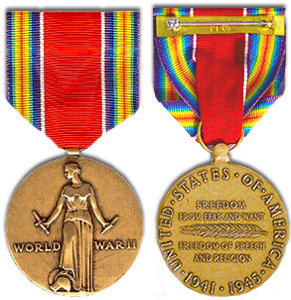 After Lyon received the first set, the military realized their mistake and sent a second set, so Lyon has two of each of the following: American Occupation of Germany, American Defense Medal, European-African-Middle Eastern Campaign Medal, WWII Victory Medal, Award of Belgium Fourigere, a Good Conduct Medal (“I don’t know how I got that one–We pulled some stunts”), a silver star and two bronze stars. And he has the memories of the men he admired–General Patton, the man who “never took the same real estate twice,” General Crittenberger, and Lt. Norman Williams who still gets in touch with him — a friend for life.